There are so many fun ideas for DIY Valentine's Wreaths. Here are a few ideas that were shared for Show and Tell Saturday. Hopefully you will find just the inspiration you need. Maybe something like this yarn wreath from Shaken Together Life that is decorated with pipe cleaner rosettes. I love the combination of turquiose, red, and pink! It is one of my favorite Valentine color combos! Blissfully Shappy made a burlap heart wreath that she hung in a beautiful frame (I always love framed wreaths). 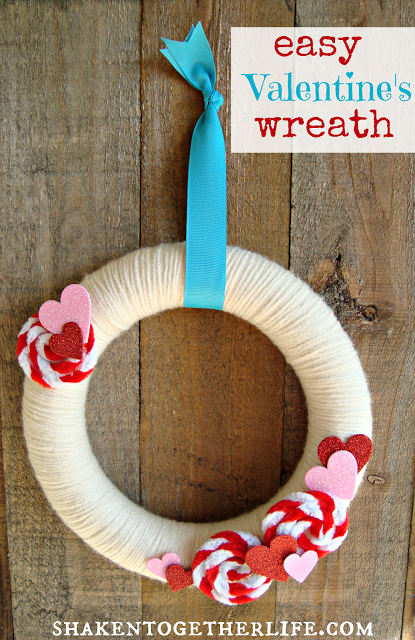 All Things With Purpose has a collection of great DIY wreath ideas, like her red burlap wreaths, both round and heart shaped. And Irish Italian Blessings took some supplies from the dollar store to create her Valentine sock wreath. 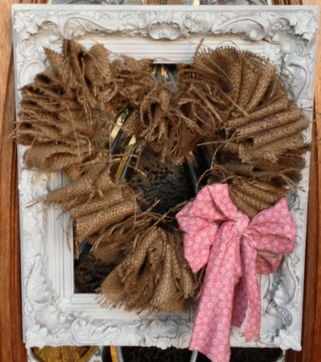 Lorie - thank you so much for featuring my Valentine's wreath today! What a sweet find! !